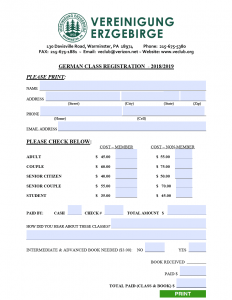 Whatever plans you may have for the future, knowledge of German will increase your options. When you learn German you acquire a range of skills which can improve the quality of your life! 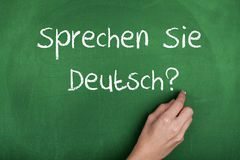 Learning German provides you with an insight into the way of life, and the hopes and dreams of people in German speaking countries, broadening your horizon. German is the language of Goethe, Kafka, Mozart, Bach and Beethoven. Indulge in reading and/or listening to their works in their original language. Make the most of your travels not only in German-speaking countries, but in many other European countries where German is widely spoken, especially in Eastern Europe. Thursdays 7:00 – 8:30pm beginning January 24, 2019. For more information, please contact: Bill Aust at 215-794-5460 or by email. Checks should be made out to: VE Club.